1. Place the raspberries, lemon juice and sugar in a small saucepan and simmer for 15 minutes. 2. Pass the raspberry mixture through a sieve and set aside - you should have around 150ml purée. 3. Mix the custard with the condensed milk until combined. 4. 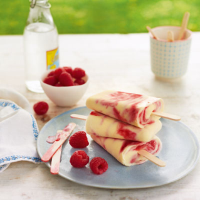 Pour a tablespoonful of the custard into the bottom of your lolly moulds, then add a teaspoonful of the raspberry purée and drag a knife or skewer through the mixture. Alternate the custart and purée, dragging each time as before, to get a ripple effect. Place a wooden stick into each mould and freeze overnight before serving. Freeze any leftover mixture in ice-cube trays for bitesize treats. This recipe was first published in Tue Jun 18 16:27:00 BST 2013.